Ian Chappell is perhaps the greatest cricket captain of all time. In 30 Tests as captain, between 1971 and 1975, Australia did not lose a series under his command. A right hand batsman and South Australian native, Ian Chappell came from a distinguished sporting family. His Grandfather Victor Richardson played cricket for Australia, including the Bodyline series in Australia in 1932-33. Ian’s Brother Greg succeeded him as Australian Captain in 1975. The third brother, Trevor, also played for Australia. Ian Chappell’s Test debut was against Pakistan at the Melbourne Cricket Ground in 1964. He would play his final test 16 years later at the same ground. Ian Chappell scored 5,345 runs at an average of 42.42 over his 75 Tests. He scored 14 Centuries with a highest score of 196. Also an occasional bowler, he took 20 wickets and was a dependable slips fieldsman taking 105 catches. In 1974 Ian and Greg Chappell became the first brothers to score a century in each inning of a Test match, all up scoring a total of 646 runs for the match. Ian played 262 first class matches for South Australia scoring 19,680 runs, including 59 centuries, at an average of 48.35 and took 176 wickets and 312 catches. In 1976 Ian Chappell was honored as the Wisden Cricketer of the Year. 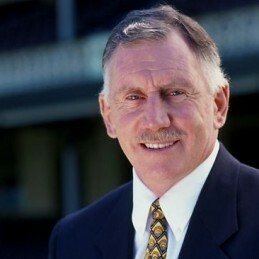 Following his retirement, Ian Chappell began a career as a cricket commentator with Channel Nine and has been a recognizable part of the Australian summer for many years.